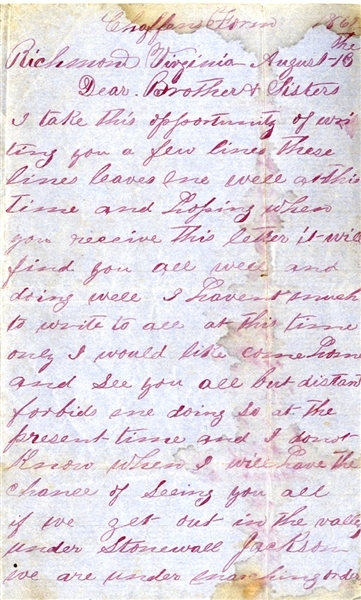 War-date Confederate soldier's letter, 4pp. 8vo., written by Pvt. William J. Scott, Co. B, 60th Virginia Infantry, [KIA Cloyd's Mountain, Va., 5/09/64], Chaffin's Farm, Richmond, Va., Aug. 13, 1862, to his brother and sisters, reading, in part: "…I will have the chance of seeing you all if we get out in the Valley under Stonewall Jackson. We are under marching orders now to go to him. We have got orders…we have taken two little marches since we have been here to meet the Yankees, but they don't come to meet us…the Yankees are leaving here & going to attack Jackson in the Valley. I saw 140 Yankee prisoners…pass by…our men was taking them off to exchange them for our men. They [were] all officers. There was two generals among them and the balance was all captains…they do not look like our men at all. They look like Yankees…you all heard that Ashby had his arm taken off…it is a mistake. He was slightly wounded…he has got well and went to his company…he is under Gen. Jackson…W. J. Scott…". Minor damp stains, else VG.